NJ Burkett has more on the victims of various squirrel attacks in Prospect Park. BROOKLYN, New York -- There is a warning about an aggressive squirrel that has already attacked at least five people in Prospect Park. The New York City Health Department is cautioning anyone who was bitten by a squirrel in the last two weeks to get checked for rabies. One squirrel victim, Leku Percival says he was feeding the squirrel when it bit him on the hand. He is convinced that it is the same squirrel that has been menacing people in Prospect Park. Percival admits it was a mistake feeding a squirrel in Prospect Park. 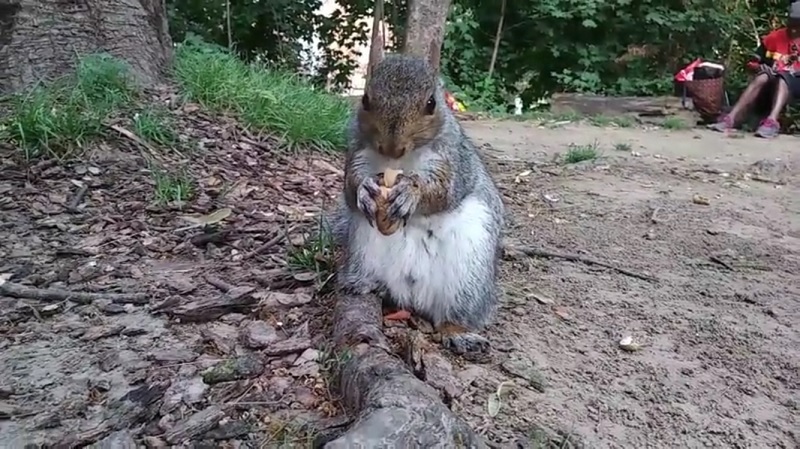 While in the video, the squirrel only nipped his finger, he later admitted he was also attacked. A total of five people were attacked - another victim was 7-year-old Maria Guerrero. Eyewitness News spoke to the young girl and her family on Sunday, and the story they told was shocking. The family says the squirrel leaped into the air and sank its teeth into the child's arm, entirely unprovoked. When Guerrero's dad heard her screams, he was able to pry the animal's jaws open, and throw the squirrel onto the sidewalk. Amazingly, the squirrel came back and tried to attack again, twice, before climbing into a nearby tree. Guerrero ended up needing stitches. "It kind of looked like a flying squirrel - he jumped on my arm and then he started to bite my arm - but I had no food! I had no food, I had nothing!" Guerrero said. 7-year-old Guerrero is being treated for rabies as a precaution even though rabies in squirrels in unheard of in the State of New York. Officials say the behavior of the squirrel is giving them some concern. Percival, on the other hand has not seen a doctor, but he says he is now worried. "I'll be there in the next 24 hours," he added. The squirrel has not yet been located. People are urged to avoid contact with squirrels, and anyone who has been bitten should report it, and see a doctor.